After solving word cookies Tiramisu Level 14, we will continue in this topic with Word cookies Tiramisu 15, this game was developed by Bitmango the famous developer known in game puzzles. The game has too many packages splitted in levels, each pack contains 20 levels where you need to find all the hidden words. And, new updates are available every weeks so, it is a must have. 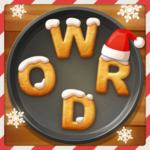 That was all you need to solve the game : Tiramisu 15 .If you are searching for next level cheats, you can find all the words in this topic : Word Cookies Tiramisu 16, you can then follow us for next update.